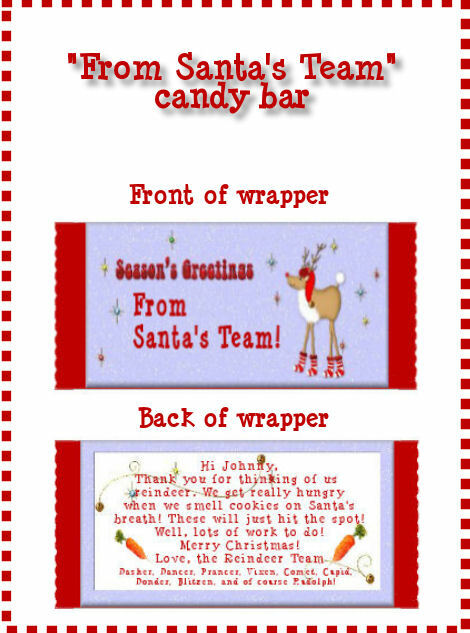 Special Candy Bar Wrappers are personalized for your child! 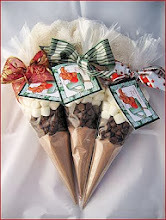 Each personalized wrapper encloses a Hershey's Milk Chocolate bar. A brief description is below each wrapper. asleep in their bed! 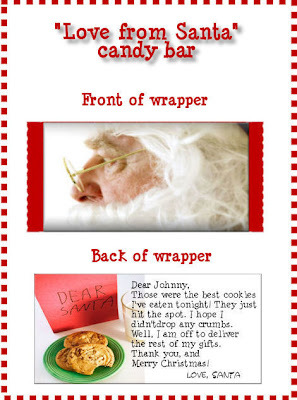 See, Santa does check! 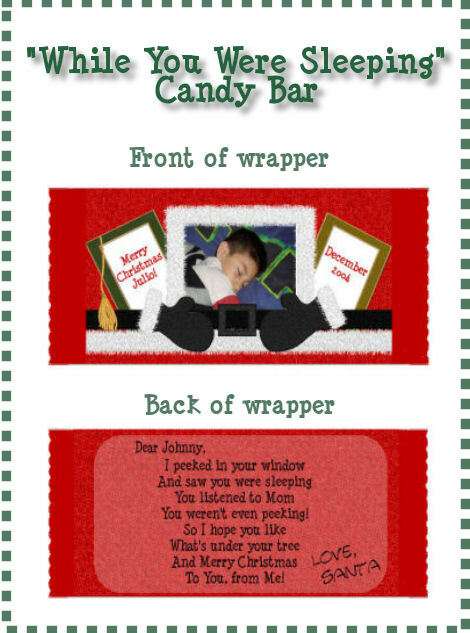 The secret to the macgic of this wrapper is to take a photo of your child asleep, and submit it with your order. 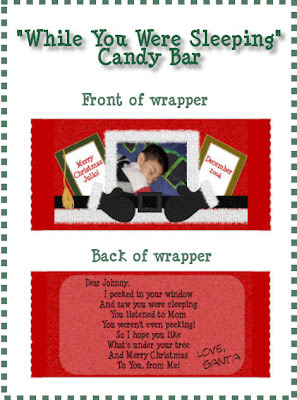 Be sure the child will be wearing the same pajamas as on Christmas Eve! On the back of the bar is a note from Santa himself, calling your child by name. 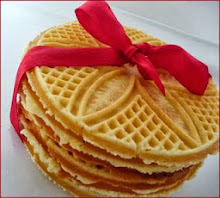 "Thank You" to your child for the cookies. Place this candy bar on the empty cookie plate, and watch the look of amazement on your child's face! There is a personalized message on the back. 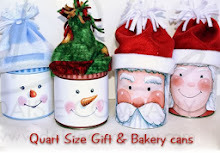 but Mrs. Claus is worried that he'll soon outgrow his clothes. 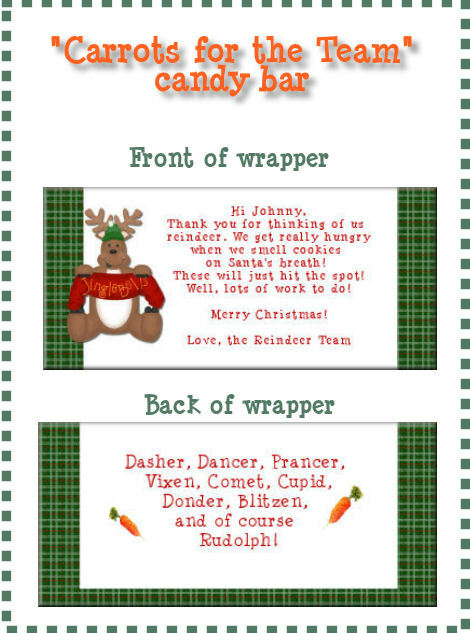 So this year she told him, "Let's try something new"
"Carrots for the Team" and "From Santa's Team"
These are candy bars that can be used to thank the child for the carrots left for the reindeer. 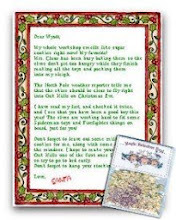 The message addressed to your child is from the reindeers, themselves!